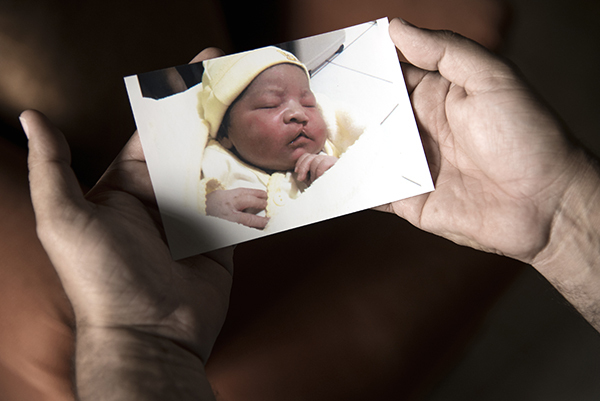 However, when their son César was born, something was terribly wrong. The doctor told Alex that his son was born with deformities, a cleft lip and cleft palate — and his advice was simply to try to avoid letting people see the baby. It would be traumatic for everybody. Nobody had answers and nobody had any help to offer — not the doctors at the private clinic or at the regional hospital in the department of Olancho in Honduras, where they live. The doctors only told them the problem could be solved by surgery, but had no information on where to go, and they didn’t know how to help them feed their son. The critical situation soon became dire. “He got very low in his glucose levels because we could not feed him — to such a degree that he almost went into a vegetative state. He lost his mobility. And yet no one could tell us what to do,” says Alex, his eyes welling up with tears from the memory. For almost eight months, Alex and Adilia desperately searched for someone who could help them. They went to private clinics and government hospitals. They drove to all the big cities. One clinic asked for 280,000 lempiras (£11,000) for the first cleft lip and cleft palate surgeries — money they didn’t have. Then, one of the doctors Alex met during the family’s search mentioned Operation Smile, but told him they might be charged for the surgeries. Other doctors at private clinics warned Alex that even if surgeries were offered for free, Operation Smile would charge them for blood, supplies and medicines — and implied it would cost them a fortune to go there. But Alex and his wife decided they had no choice but to try Operation Smile as a last resort to save their son’s life. On the way there, even a taxi driver warned them about Operation Smile, saying they stole children’s organs and let medical students practise surgery on patients. “We came with a lot of fear because everyone spoke very badly of the foundation. They gave us very, very bad information, completely negative. Even so, we went there as a last resort. I talked to my wife and told her that we were going to make this last attempt, and we were going to help our child in any way we could. If God decided for him to die — we would accept it,” says Alex. 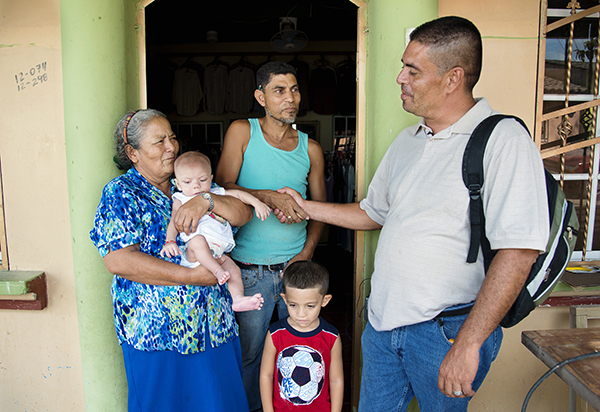 Alex’s son received surgery a few weeks later — it didn’t cost them a single lempira. At that moment, Alex made a commitment: “I made a promise to God, to Operation Smile and to my son that for as long as I live, there will not be one single person in the whole department of Olancho, living with an untreated cleft lip or cleft palate. I don’t want anybody to go through what we have been through." Three years have passed, and Alex and his family spend all their spare time helping other parents and children receive the care they desperately need, primarily by sharing information about how to receive help, but also by helping them with logistics, food, lodging and transportation to the hospital. Everyone he meets and/or helps calls him Don Alex (the use of the honorific Don conveys respect for that person). Don Alex now works as the assistant to the Health Minister of the region, and has now visited all the 230 health clinics there, providing them with information about Operation Smile. He has given his phone number to the regional hospital so they can call him anytime, as soon as they see a child born with a cleft condition. He makes radio announcements and makes television appearances to reach every corner of Olancho — an area of Honduras that is larger than the neighboring country of El Salvador, and home to more than 700,000 people. Don Alex often visits the families at home, bringing his son to show them there is indeed hope, there are people out there wanting to help — and they do it for free. Together with the rest of his family he also runs an event-business during weekends, renting out tables, chairs, table cloths and other things for parties — donating part of the profit to Operation Smile. “Before Don Alex started his volunteer work we lost these cleft lip and cleft palate patients. We don’t have any plastic surgeons here. They never got the medical care they needed, they lost weight, they were malnourished and many died”, says Dr. Ramón Irías, paediatrician at the regional Hospital San Francisco in Juticalpa, Don Alex’s home town. The overwhelming majority of the people Don Alex helps live in extreme poverty. He explains that most of them don’t have enough food to eat more than one meal a day. They live day by day and only earn, at the most, £2-3 on the days they can find a temporary job. Most families have many children to feed. They do not even have the money to pay for the bus to the closest health clinic, let alone a bus ride to the closest hospital in a distant city. Many of them can’t leave their children at home or afford the time away from work — if they have a job. Juan is one of these people. His son José was born with a cleft lip. 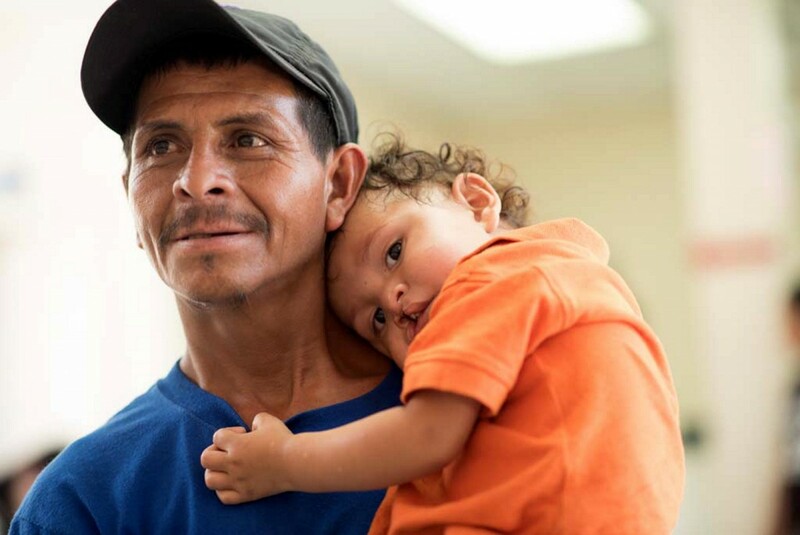 Juan’s wife abandoned the child when she saw him, leaving Juan to care for his son alone. Because his wife will no longer let them live at their house, he and his son live in a grain storage container on her family’s property. He works hard harvesting crops, and receives no more than £2-3 a day. When these months end, he is mostly out of work for the rest of the year. “It was the paediatrician at the hospital who called me to tell us about the child. I drove there with my wife and César in the middle of the night to see them. The mother thought the son had a disease and didn’t want to keep him. We managed to convince the father to stay in the hospital with his son, and later we took him to Operation Smile’s centre in Tegucigalpa. We have become close friends, and we speak on the telephone almost every day,” says Don Alex. 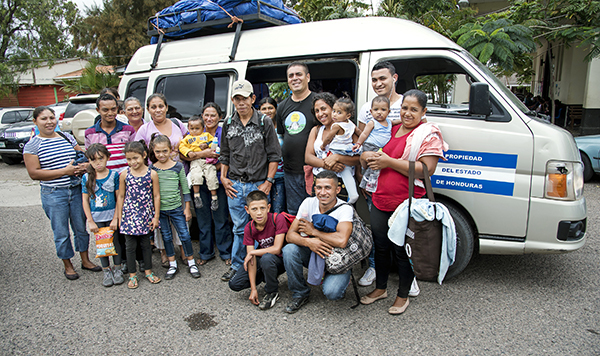 Don Alex and his family help Juan and his son with transportation, food and accommodations if he needs to come to the city. They take care of him, as they do with all the patients and parents they’ve found. On the first day of Operation Smile’s international medical mission in Tegucigalpa’s Hospital San Felipe — only steps away from Operation Smile’s care centre — Don Alex brings Juan and little 2-year-old José, along with 18 other parents and patients from Olancho. This is the sixth visit for Juan and his son. During previous visits, José has been too sick or malnourished, making it too dangerous to anaesthetize him. It is now the early morning of medical evaluations, and the line of patients and parents is growing longer. More than 300 patients are expected to arrive. “What we are doing here in Honduras is really exciting. We are trying to identify the backlog of clefts and meet the surgical needs for all those patients. So we spent pretty much the whole last year doing a national registration campaign, working together with the electric meter readers in Honduras. They went from door to door to read the meters and at the same time they asked if there was anybody in the household with a cleft,” says Jordi Baron, Programme Officer at Operation Smile. 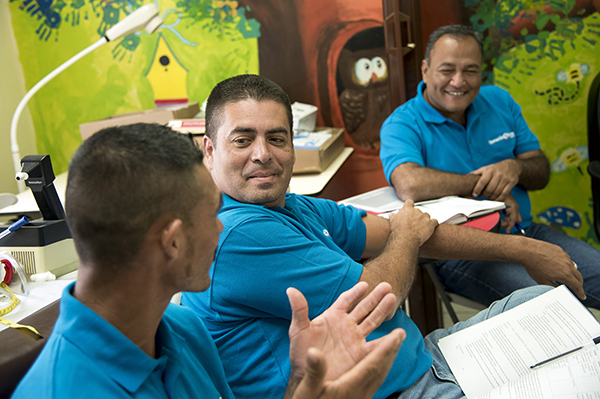 Five hundred workers from the company Ingenería Gerencial covered 32 cities in all of Honduras. 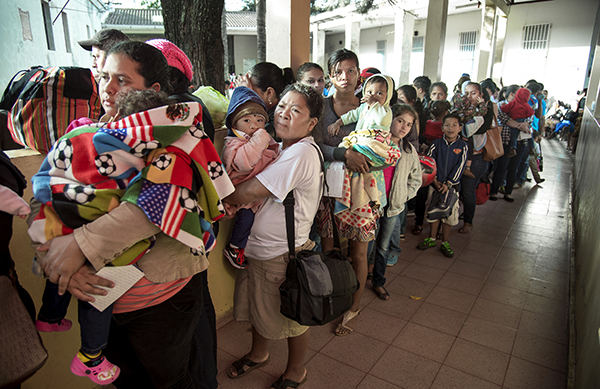 The result: 600 new patients who had never had prior treatment from Operation Smile. However, even though Operation Smile now has the phone numbers of these patients, many of them have been impossible to reach and thus, impossible to treat. “There are many reasons why they [people who need surgery] don’t come to the centre — one of the biggest barriers is the financial one: the costs for transportation, the salary they stop receiving from the moment they leave … and they need to find someone to take care of the other children staying at home. Other barriers could be that the roads are not always in good shape, especially during the rainy season. 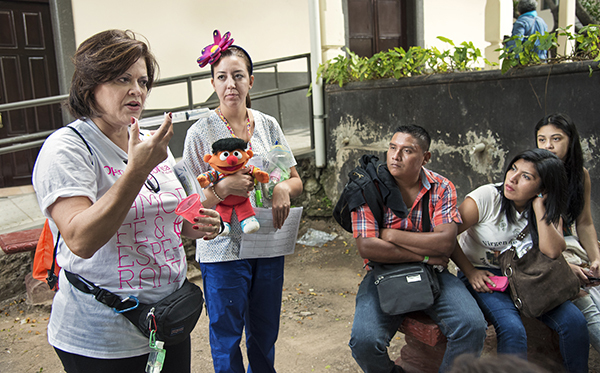 Many patients come from rural areas and they need up to two or three days to come to Tegucigalpa,” explains Yanuario García, project manager of the Acompañando Sonrisas pilot program, which is a solution to the patient recruiting problem they are facing. The programme is inspired by the work Don Alex is doing in Honduras. “There are seven of us so far. We are parents who have lived through this experience. We can do this with a little more love, a little more dedication — because we don’t want anyone else to go through what we have gone through. That is why we are so committed and we hope to bring many, many patients to the centre,” says Don Alex after his first training session with the group.